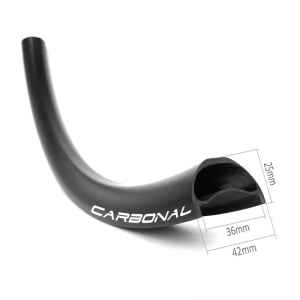 Carbon mountain bicycle downhill rims feature strong, stiff, durable and compliant carbon rims designed for punishment. Available in 27.5-inch and 29-inch versions, our downhill rims are heavier weight due to the additional reinforcement. The thicker walls can handle heavier and more aggressive riders making this the best choice for freeride and downhill style riding. 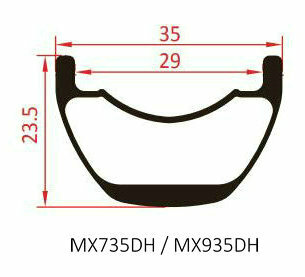 650b - symmetrical rim profile - MX735DH, 23.5mm deep, 35mm external, 29mm internal, 520g. 29er - symmetrical rim profile - MX935DH, 23.5mm deep, 35mm external, 29mm internal, 540g. 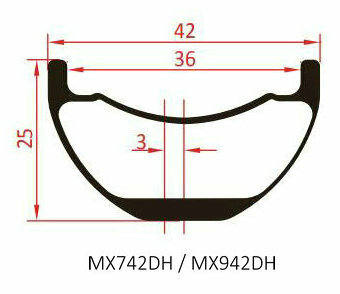 650b - symmetrical rim profile - MX742DH, 25mm deep, 42mm external, 36mm internal, 540g. 29er - symmetrical rim profile - MX942DH, 25mm deep, 42mm external, 36mm internal, 560g. *We offer 4 models (center or 3mm offset) of spoke hole drilling on the MX742DH & MX942DH carbon rims.